Gloriosa Daisy is a deer-resistant variety that adds rich, gorgeous color to the summer and fall garden. A perennial form of the native Black Eyed Susan, Gloriosa Daisies grow to be 12-36” tall and tolerate partial shade. Giant, bi-color double flowers are extremely easy to grow and bloom reliably year after year. 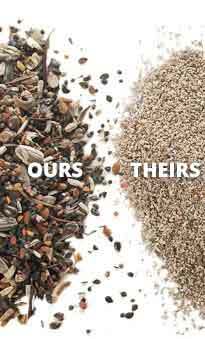 All of the seed we carry at American Meadows is non-GMO, neonicotinoid-free and guaranteed to grow. Basic color and sandpapery leaves are identical to its parent, the black-eyed susan, but flowers are much larger, varied in form, and most important, this species is perennial, while black-eyed susan (R. hirta) is biennial, making its yearly bloom less dependable. A truly fabulous plant for meadow color. Also great for cutting. 1/4 lb covers 5,445 sq ft.
1 lb covers 21,780 sq ft.